Despite the bad press that Mark Zuckerberg and his team have received of late at the all mighty social media giant that is Facebook…regarding data scandals and so on….the fact of the matter is, Facebook is going nowhere. There are still over 2 billion active users on Facebook each month. The question is, as a content creator, what are the best ways to repurpose your content onto Facebook to get in front of your ideal audience on the platform? 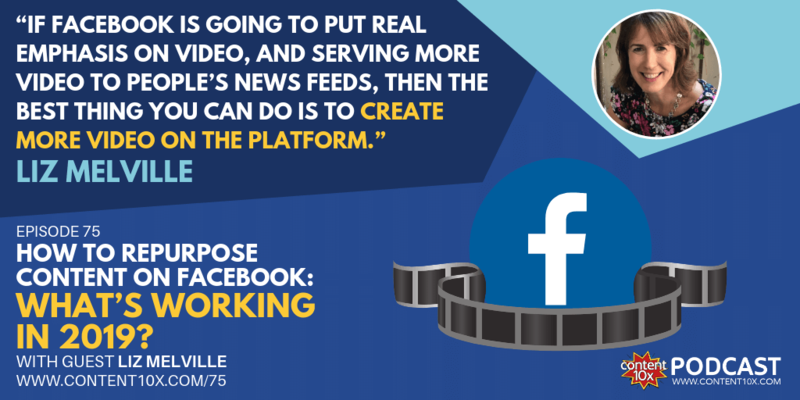 Or, if you’re already creating lots of content on Facebook, how can you repurpose it? On the Content 10x Podcast I had the pleasure of speaking with Liz Melville, a highly regarded Facebook ads and marketing specialist, with over eight years of experience in promoting brands and businesses online, to find out more. Liz’s clients spend tens of thousands of dollars on Facebook ads each month and include some of the biggest names in Facebook and online marketing. Liz and I met when were were both speakers at Janet Murray’s Content Live event in London in November 2018. Liz delivered a fantastic talk on Facebook and I knew that I just had to invite her onto the show! There’s no doubt that Facebook is an extremely powerful social media platform. If you know how to use the platform correctly, i.e. and if you can create engaging content that people enjoy, then you have the potential to reach millions of people. But more importantly, you have the potential to reach your ideal audience. Whilst organic reach on Facebook is without question a challenge. It has diminished considerably in the past few years for business pages in particular (damn that pesky algorithm!). But, it’s fair to say that few platforms can rival its advertising and marketing potential. The Facebook ads platform is without question the most powerful advertising platform in the world of social media – the audience targeting features are incredible. Facebook just isn’t intuitive when it comes to advertising; therefore content creators aren’t getting the best out of it. The advertising platform is powerful, with custom audiences, lookalike audiences, retargeting…etc. In fact, I’m sure we’ve all been there where we’ve looked at a website considering to buy something, and the very next time we go onto Facebook we are advertised the exact item we were pondering whether to buy!! This is no coincidence. What kind of content should you post? And what content should you go further and use with Facebook ads? Read on…. Liz explained on the podcast that Facebook is heavily focused on compelling video content that engages people. Video content is the top priority within their algorithm, so even just knowing this fact can allow you to get ahead of the game. What sort of video content should you post on Facebook? Well of course you can create native video content on the platform. But when it comes to repurposing, if you are already creating video content elsewhere, e.g. for YouTube, your website, your membership community…etc, you can create shorter videos from under a minute to around 90 seconds, that make a point, engage and connect with your audience. Find out more about creating short video clips for social media in my podcast episodes and blog posts The Importance of Video Marketing and 6 Tips For Repurposing Video Content For Social Media. So when you have video content within your content arsenal, look at how you can repurpose it on Facebook. Facebook Live, in particular, offers many ways to repurpose your content. In fact, at Content 10x almost half of our clients have a Facebook Live repurposing service – where we take their video every week and repurpose it into lots and lots of new content (if you want to find out more click here). Also, check out Creating Live Experiences With Your Content where I share why I love repurposing live content. Liz explained that in her experience, when using Facebook Live a good duration to aim for is around the golden 15-16 minutes. It’s important to get people engaged in real-time on the platform. However, frequently you may see fewer people than expected turn up to your actual Facebook Live session. But, they watch the replay – in fact more people will watch the replay than join you live. How do you then go ahead and repurpose your Facebook Live video? You can cut up your Facebook Live video, turning it into multiple short videos, each with a specific point in mind, to generate an emotional reaction from your audience. Attention spans these days are short and are shortening, so you need to think really carefully about what your audience wants to consume. These smaller videos are a perfect way to test out what formats work, what lengths work, and what people do and don’t respond to. You can also turn your Facebook Live video into a written article, into a podcast episodes, into graphics, into a YouTube video….and so much more. It’s all about having a repurposing mindset. Of course, there are many things you shouldn’t be doing as well. The second point to make about quote style images is that they have a much lower priority on Facebook’s algorithm than videos, so unless your content is frequently amazing, there shouldn’t really be a focus on using them. And if you do use them, use them very carefully indeed. It can be tempting to think: ‘I haven’t seen any meaningful engagement, so I’ll just up my post frequency through the roof.’ You should stop right there! Facebook wants excellent content, but it’s more about being regular with it and consistent in your approach. What I mean is having a content schedule. How much exactly? Posting three times a week is a substantial number to work with, but if you honestly have high-quality content ready for every single day of the week, and can commit to it, then that’s even better. It’s about great content first and foremost and then asking yourself what more you can do to widen your reach. Once you’ve settled into a good content rhythm, that’s when you should consider boosting your Facebook posts. Boosting posts selectively on Facebook can double down on your success, but be careful not to overuse it. Facebook groups are another part of the platform that people devote their time to. 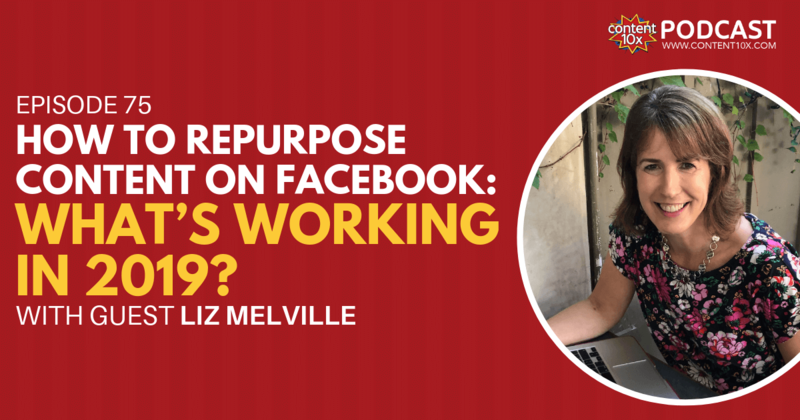 While it’s great to repurpose content across Facebook, Liz recommended that you shouldn’t be posting the same content to your Facebook group as the content you post on your Facebook page or personal profile. You really need to be thinking about your purpose for each of them. What does the group want to see? What do people on my primary page need to look at? Facebook groups are successful when it comes to building a community of people, so you need to keep that in mind. Your Facebook page, however, is more about raising the initial awareness of your business. When you repurpose content from your blog, video, podcast etc, onto Facebook, have a strategy for the kind of content you want to put on your page to raise awareness, and if you have one, in your group to build community (or whatever your reason is for having a group). The key point here is just because you have different places to post content on Facebook, doesn’t mean you should post the exact same content everywhere. Be strategic. 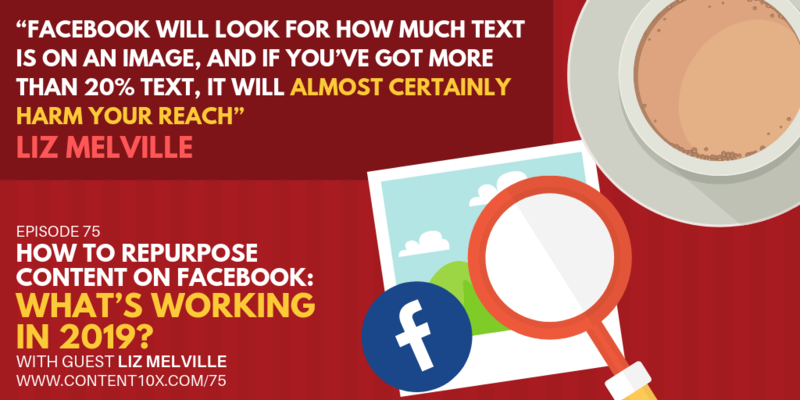 There’s lots that you can do to repurpose your content onto Facebook. Particularly your video content. Whether you like the platform or not, there is no denying that a) a lot of people use Facebook everyday including, most likely, people you want to reach, and b) the Facebook ads platform is by far the most powerful advertising platform in existence right now. Are you making the most of this? Going live on Facebook is a great thing to do and you can really grow your audience and build a community by regularly going live – but don’t let your live video content go to waste. Look to repurpose your video into shorter videos, written content, visual content and so much more. For more on Liz, you can check out her podcast, Ads that Convert, right here. Previous Post How to Promote Your Content Like it’s a Movie Premiere! Next Post Can You Improve Your Content Distribution?